Drivetrain | We know that an automobile is able to move due to Engine. But have you ever thought of how transmission of power occurs from Engine to wheels? Which parts of the vehicle are responsible for transmission? What are the different types of layout of that system? So here am gonna write about all these questions. 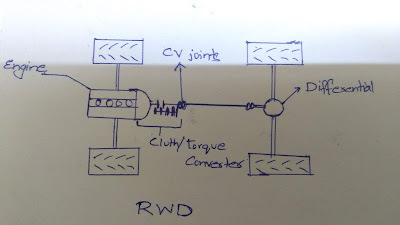 And some knowledge about Drivetrain layout(FWD, RWD, AWD etc). All the components or the parts from engine to wheel axle which are helping in transmission comes under Drivetrain. In simple words, it's the system helping in the transmission of power from an engine to the wheel axle. 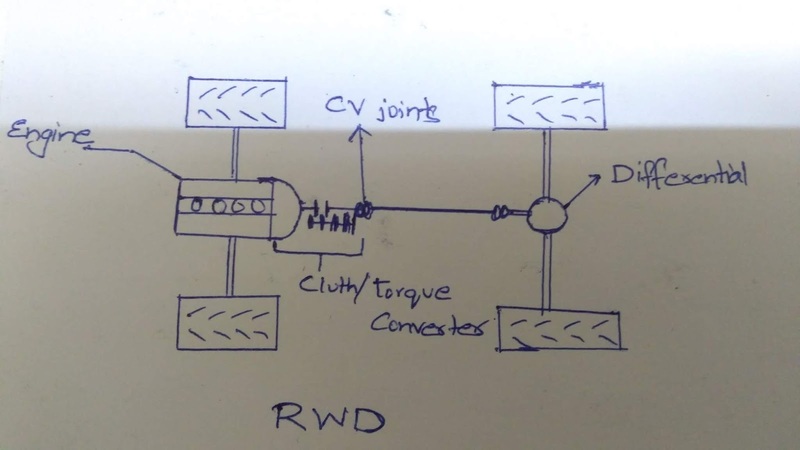 Study of the drivetrain will give you all the answers about how linear(up & down) motion of the piston is converted to rotatory motion and that how that rotation is transferred to wheels. The main parts that come under drivetrain are driveshaft, CV joints, axle shaft, Universal Joint, and differential. Now, these are categorized on the basis of which pair of wheels are given power; Front wheel drive or Rear wheel drive. Here, Am only gonna talk about Front and Rear Wheel Drive. 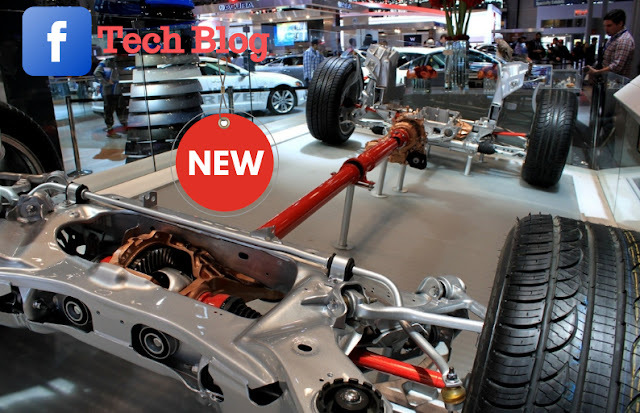 You will know each reason for using or not using Front wheel drive(FWD) or Rear wheel drive(RWD). In the next post, you will get the detailed explanation about other types. In this layout, the power from the engine is given to front wheels i.e. the engine drives the front wheel. Somewhere between 1895-1898, the first front-wheel drive layout was used to power front axle. But it was a flop, we never saw it's mass production. The first successful commercially used front-wheel drive layout came in 1989. BSA(Birmingham Small Arms Company) invented unique front-wheel drive. So this was all about what is FWD and its history. This layout is mainly used in small cars. You will get to know the reason below as when you will be going through Pros and Cons of different drivetrain layout. Now let us understand the Pros and Cons. Compact Engine hence less Space required: As you have seen many everyday car has engine in front. Now as you know power from engine is given to front wheels in this layout so the whole system will be compact i.e all the drivetrain parts and engine will be in front and will require less space. Driving wheel has most weight hence more traction: The engine and the whole drivetrain is in front and the power to is given to front wheel so that becomes the driving wheel and hence has more weight. Hence more traction. Less weight: Since the driving wheels are front wheels and most cars are having an engine in front so we don't require a drive shaft or rear axle assemblies to send power to back. So fewer parts means less weight. Low-cost production: Fewer parts required, Easy to design and production in masses hence it cut down the production cost. Thurst in Intended direction: Since the front wheel is facing more traction so friction opposes the movement of that direction(simple physics) and here comes the role of rear wheels which are in inertia and will push from the back and hence provide thurst in the intended direction. Torque Steer: Heavy vehicle tends to move in one direction or the other that depends on layout. So while steering the handling is difficult and hence it can result in heavy acceleration. So that's why we don't use FWD layout in heavy vehicles. Loss of grip under heavy acceleration: Due to torque steer there's chance of heavy acceleration and even while accelerating more at once can cause loss of grip as most of the weight transfers to back while acceleration and that can cause loss of grip and in some cases, even lift front tires. Uneven tire wear: Since in Front wheel drive, the front tires do everything. There's more traction and more weight on front wheel hence it wears faster as compared to rear wheels. So this results in uneven tire wear. We even need to change CV joints often. So these were some advantage and disadvantage of using front wheel drive in a car. One should be aware of advantage and disadvantage before buying a car. Even environmental factors matters. Let us now understand what are advantages of Rear wheel drive(RWD) over Front wheel drive(FWD) and why we are not using RWD in usual cars. In this layout, the power from the engine is given to rear wheels i.e. the engine drives the rear wheel. The main type is front-engine, rear wheel drive also called as FR where the engine is in front and the driving wheels are rear wheels. The first FR was made in 1895 with the Panhard model also known as "Systeme Panhard" in early days. In this drivetrain layout, the power from the engine to rear wheel is transferred through drive shaft or rear axle assembly. You can see it in "Drivetrain Parts" picture above. 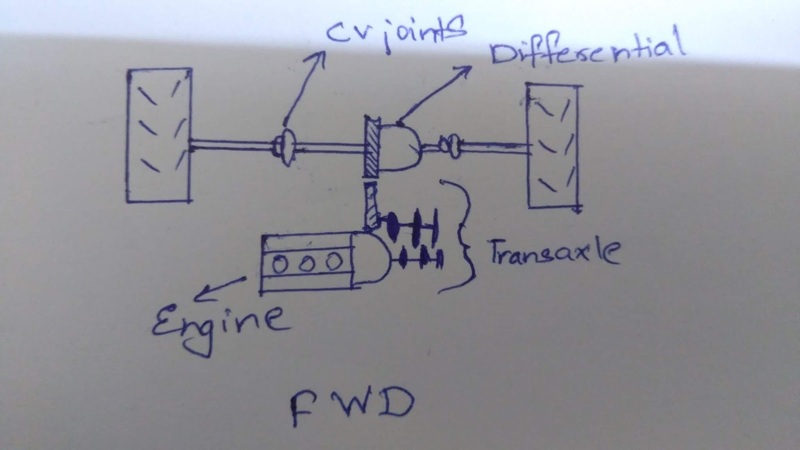 Due to rear axle assembly/drive shaft the weight was increased so in order to reduce relative weight of shaft the total assembly was split into two parts : (a) Gear box (b) Final drive. 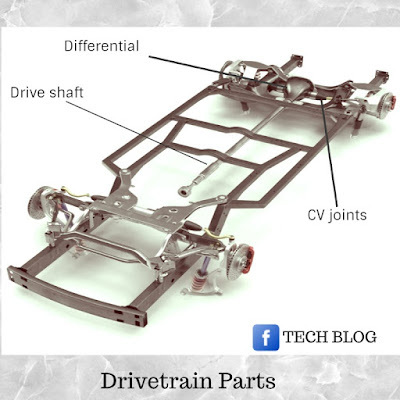 This drivetrain layout is used in sports/race cars. Cop cars and service vehicle are mostly RWD. So let us find the reason behind it while going through Pros and Cons of using Rear-wheel drive(RWD) in cars. Better weight distribution: Sports/race cars deal with high speed and acceleration so proper weight distribution is necessary for traction and braking. So in front engine rear wheel drive(FR) some weight of the engine is balanced by the drive shaft/axle assembly at the rear hence proper front-to-rear distribution. And more balance means better handling. Better grip/traction: During acceleration, the weight gets transferred at back and since the power from the engine is given to the rear wheels, they can easily push the extra weight at back. Splits task for tire: Since power is transferred to rear, the rear wheel does all of the acceleration and front tire does most of the braking. So resulting in even(equal) tire wear and hence is advantage over FWD. Oversteer: While turning if you don't care proper handling(turning with high speed as in race cars) it can be risk as the vehicle gonna oversteer. Increased weight: Due to the addition of extra driveshaft/rear axle complexity it increases little weight of the car. Not good for poor weather: Due to engine on the front their's less weight on driving wheels and hence we get much less traction in for snow, ice or sand surface. I recommend not to use these cars in such weather condition. I hope you are now clear about all things related to drivetrain and it's two layout RWD and FWD for now. You know which drivetrain layout car to buy according to needand conditions after knowing each's advantage and disadvantage. Some of you must have thought what if engine was pkaced in middle or rear? Then which will have more advantage? Answers to all these will be given in upcoming posts related to drivetrain. I have tried to explain each part in detail. If you have any doubt do comment below. Don't forget to subscribe to our newsletter for being updated to upcoming post where am gonna share more information related to other drivetrain layouts. Do Comment, Share and Follow! Do you use mat lab?? No. I use Solidworks for now. Soon I will be learning that. Am now into Exams. I will be writing another article within a week. Thanks for your support. Topic you are interested in?? I found this web site, I couldn't find any knowledge on this matter prior to.Also operate a site and if you are ever interested in doing some visitor writing for me if possible feel free to let me know, im always look for people to check out my web site. This is actually the kind of information I have been trying to find. Thank you for writing this information. Appreciating the time and exertion you put into your site and nitty gritty data you offer!